As you head into a new school year, make yourself this promise: I will not skip share time during writing workshop! Share time is just as important to writing workshop as the minilesson and independent writing time. Share time is another opportunity to teach and to assess. Also, coming back together as a whole group after writing builds classroom community and provides a sense of closure for the students. In our district, we call this time “reflection” (using Ellin Keene’s literacy studio language.) This subtle change of language helps us remember the true purpose of this 5-10 minute time each day: to reflect on ourselves as writers. Teachers link back to the minilesson and the day’s learning target. In this way, writing workshop comes full circle each day. Make yourself a promise this school year that you will not skip share time. Plan for share time in your daily lesson plans. Write it down, and highlight it in yellow. From the first day of writing workshop, set a timer for 5-10 minutes before your writing workshop ends. When the timer dings, it is share time. Don’t skip share time! Whole Class Share Everyone gets a turn to share. This works well for a product share when the content will be only a few words, such as sharing a title or a single line from a piece of writing. It helps to give the listeners an active role. The listeners can sit, notebooks in hand, ready to write down any tidbit they would like to use in future writing. Turn and Talk Talk to a partner. This is a nice alternative to the whole class share. Everyone still gets a turn to share, but they share with a partner instead of the whole class. Make an Anchor Chart Record the day’s learning on a classroom chart. 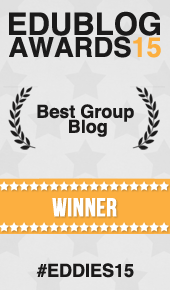 This is a concrete way to link back to the minilesson and reflect on the day’s work. Rather than creating an anchor chart during the minilesson, save it for share time after students have had a chance to try their hand at the day’s lesson. Thumbs Up/Thumbs Down Restate the learning target for the day, and have kids rate themselves as writers. For example, you could say, “Today we learned that writers sometimes use pictures to add detail to their writing. Think about yourself as a writer today. Thumbs up if your picture added detail, thumbs down if it didn’t, and thumbs to the side if you’re not sure.” This only takes a minute to accomplish, but it encourages students to reflect on themselves as writers, and it gives you a quick reading of the class. Reflective Questions Ask students to think about themselves as writers. Examples are: What did you learn about yourself as a writer today? What did you try as a writer today? What did you struggle with as a writer today? Everyone can share with a partner, a few students can share whole class, or no one can share as they simply sit quietly and think. Teacher Choice The teacher strategically chooses one or two students to share their process or product that day. Choose students who did an exemplary job of meeting the learning target that day. Or choose a student who took a risk as a writer. The student shares their work or their thinking as a writer, and share time becomes another opportunity to reinforce a teaching point. Written Response Instead of sharing orally, students can quickly reflect in writing on a Post-It note or an exit ticket. This is helpful for the teacher who needs to do a whole class assessment of the day’s work or plan small group work for the following day. Go Digital Use technology to share. Students can tweet out a reflection at the end of writing workshop or contribute to a class Google document. Just as you would never skip your minilesson or independent writing time, don’t skip share time this year! 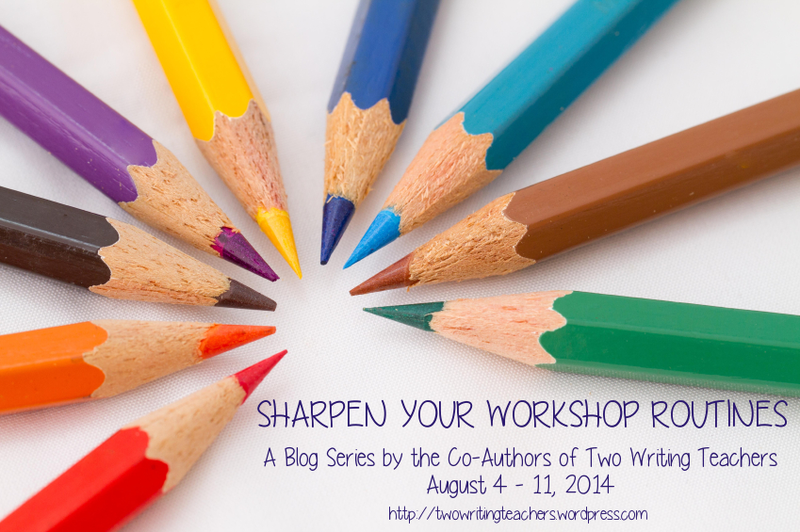 Let’s have a conversation about sharpening workshop routines. We’ll wrap-up our week of blog posts with aTwitter Chat on Monday, August 11th at 8:30 p.m. EDT. This will be an opportunity to talk about procedures that have worked in the past and new ones to start before the school year begins. We will use the hashtag #TWTBlog. If you have one of those times when sharing does get nixed for whatever reason, it’s great to start the next writer’s workshop with sharing first. This works well for product sharing. The children share writing from the day before, and the writing workshop begins with excitement about writing and the writing energy is high. I occasionally began my writer’s workshop with sharing on purpose for these reasons. Love the different options on how to share! Like Beth, I, too, love this post! I’ll be honest… there were quite a few days I had a quick partner share because I didn’t want to make time to share. And then I read Leah Mermelstein’s book on sharing and that changed a lot of things for me. Timing is everything– with that in mind I know that I have to include the share in my plans otherwise it will not happen. I’m thinking about using a special signal (chimes maybe) to indicate share time. Me too! For a long while I’ve designated Friday as share day & let everyone go. With 16 in the class it worked, but wasn’t fabulous. Third graders love to share. Some days it was torture. Daily sharing is definitely one of my goals. Do you assign students to share, or just take volunteers? I am almost finished reading Don’t Forget to Share by Leah Mermelstein which also focuses on the importance of the share as well as practical advice on the four different types of shares: content, process, product and craft. An easy read that can immediately be implemented in the classroom. I read something recently about sharing at the beginning of the block. It can act as inspiration to the days writing. Something to consider.